360 Vegas Podcast: E-145: Is It Racist? This week’s winner proves that if there is a heaven, it is in Las Vegas. 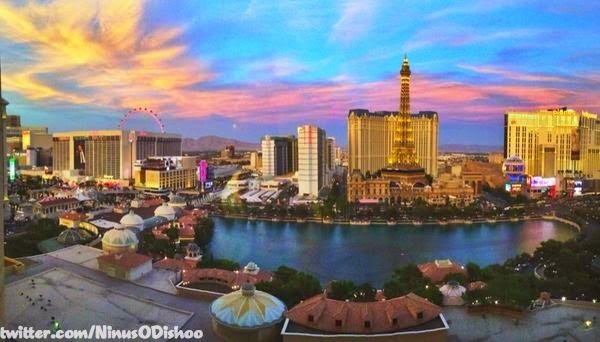 @NinusODishoo shared a picture, a panorama; he took from his room with a view of the strip. So much beauty, it causes the mind to boggle and the loins to moisten and/or harden, respectively. The prospective is from Bellagio, across the lake and captured everything from Harrah’s to Planet Hollywood set against a soft pasteled sky. Once again the density demonstrated in these photos that capture large selections of the strip show you how no other city on the plant can replicate the Las Vegas experience.